Zante Ferries - View timetables, Compare and book ferry tickets at directferries.ie. Zante Ferries, formerly known as Cyclades Ferries, operates frequent crossings from the Greek cities of Killini and Piraeus to the Cyclades and Ionian Islands, the most popular archipelagos in Greece. 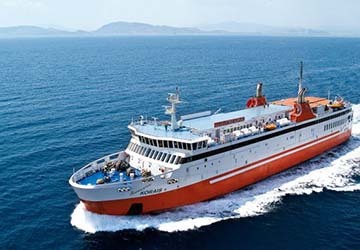 Having sailed the Aegean from Piraeus Harbour for many years, Zante Ferries has become one of the biggest ferry companies in Greece, carrying thousands of passengers every year. Their fleet consists of three large ships called Dionysios Solomos, Andreas Kalvos and Adamantios Korais, offering a wide range of onboard services. They boast modern, stylish cabins ranging from deluxe standard to economy, and you can enjoy a selection of delicious light meals, snacks and refreshments in the cafes and restaurants. Given the size of the vessels, they can hold a great number of vehicles, too, ranging from large to small cars and motorcycles. Passengers are also allowed to travel with their pets at no extra charge, with plenty of kennels available on board. Some smaller pets may be taken to the open deck, however, all owners must carry a valid EU Pet Passport. With directferries.ie you can find Zante Ferries timetables, fares and book Zante Ferries ferry tickets. Where applicable we’ll also compare Zante Ferries with alternative ferry companies. Excellent service, and a very good price. The trip with the Zante ferry was really amazing and comfortable. The seats were good. Competent staff. Good cleaning. IT WAS TE FIRST TIME AND I WAS SATISFIED OF THE FERRY TOOK FROM PIREAU TO KIMOLOS. ONLY BAD THING IT WAS ON THE RETURN JOURNEY THE TIME FROM THE PIREAU TO THE AIRPORT AND WITH THE CAB 180KM/H. THE AIRPORT IS TOO CLOSE. 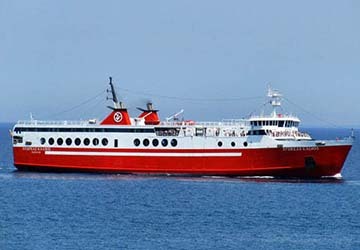 "Nice journey form Thira to Folegandros"
Punctual ferry, nice trip with stops to differnt islands before arriving to Foleagandros; the sfaff was kind and competent; clean and spacious ship, our seats were comfortable. I woul improve the bar service because it was not well equiepped, especially if we talk about the food, a part from this it was a nice journey that I recommend.